It only happens once a year! It’s Oscar weekend! As you all can tell by now, I love awards season and the Academy Awards are, of course, my favorite. 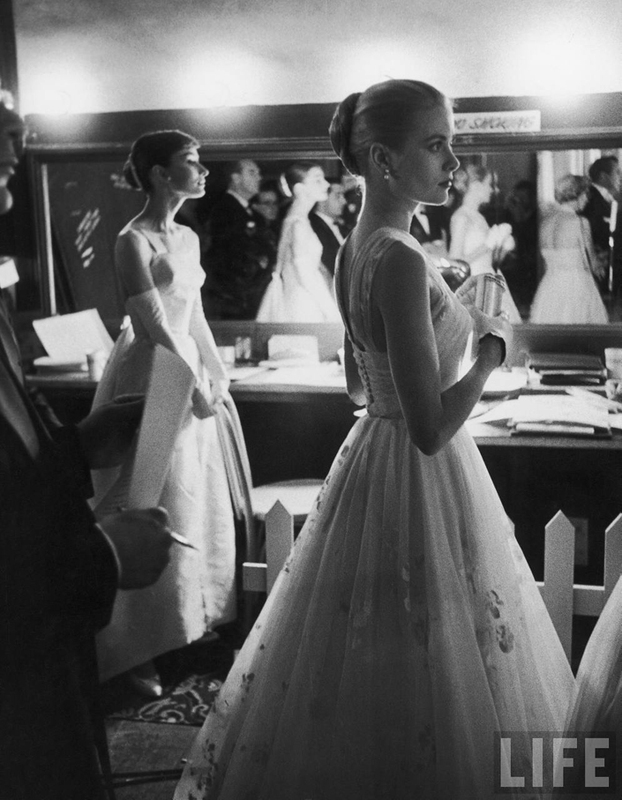 I love this picture of Grace Kelly and Audrey Hepburn backstage at the 1956 Academy Awards. What beautiful ladies! I’ll be watching this year’s show from a friend’s house. Any plans for you all? (You must check out this DIY Oscar party from Twig & Thistle. It’s so adorable – lots of inspiration!) Have you all seen any of the nominated films? I had big plans to attempt to see all of them this year before Sunday, but I just couldn’t squeeze them all in. I’m hoping The Help takes home a few awards, as well as Midnight in Paris for Writing (Original Screenplay). As much as I adore Meryl Streep, I would really like to Michelle Williams go home with the Oscar for Best Actress. Speaking of Michelle Williams, any predictions on her Oscar gown? She’s always a red carpet favorite of mine, and her 2006 Oscar dress is still one of my all-time favorites. There’s lots of red carpet fashion to look forward to! Happy Weekend! OK, that party is adorable. And I'm rooting for Michelle too. She's so great! Same, rooting for Michelle. She deserves it! Can't wait for Sunday. I love this photo! Herpbun, Kelly and all that tension…glamour and drama, that is the Academy Awards Celebration to me. I hope Michelle wins, too, and that 2006 marigold dress was unbelievable. She is flawless. Happy Oscar weekend! happy Oscar weekend as well. Can't wait to see what everyone is wearing. Right there with you! Have a great weekend. Absolutely love that photo of Grace and Audrey!